¡This property has been verified! Villa Bigamendi is a house of 300 m2 with 1000 m2 of plot located at the entrance of the Levantina neighborhood. 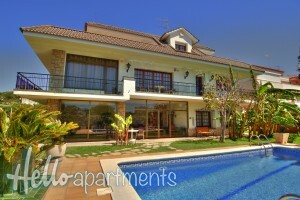 This Villa is located in such a way that you can walk to the beaches and the center of Sitges in 10 minutes. There is a large supermarket located 5 minutes walk away. Villa Bigamendi is constituted by 3 plants. On the ground floor there is a glazed porch to pass the lunches. The garden surrounds the house with plant areas, barbecue area and lawn area with a beautiful swimming pool with trampoline and sunbeds for sunbathing. In the garden you can park up to two cars. On the first floor there is the large living room and dining room. There is also a fourth extra room, it is without air conditioning. On the second floor there are 3 rooms with air conditioning and terrace for two of the rooms. This Villa is in very good condition and is perfect to have a quiet and private place but near the center of town. Bed linen and towels are included. Cleaning service prior to check in and after check out. For stays longer than 14 days we offer clean linen and towels at mid stay. The property has cooking utensils. The property has private parking (subject to availability). Pets are allowed under petition. An extra charge can be applied. Check in is at 3 pm. Arrivals after 9 pm have an extra charge of 30 €. Arrivals after midnight have an extra charge of 50 €. Early check in is subject to availability and has to be previously coordinated with the Hospitality Manager. Check out is at 11 am. Late check out is subject to availability and has to be previously coordinated with the Hospitality Manager. There are baby seats available, check with us. A photo ID issued by government authorities will be required at check in. A credit card or cash deposit will also be required at check in to cover any incidental.The special requests cannot be guaranteed and are subject to availability at check in, they can incur in extra charges. A first payment of 30% has to be done to guarantee the reservation. The remaining balance has to be paid 15 days prior to the check in date. Taxes and Service Charges:10% VAT included. City Tax of 0,90 € per person per night is not included (maximum of 7 nights, children under 16 do not pay). A security deposit will be required at check in and has to be paid with credit card. It will be reimbursed 48 hours after check out after checking that the property is in perfect conditions. If the cancellation takes place after making the reservation, 30% of the total amount of the reservation will be charged. If the cancellation takes place 1 month prior to the arrival day 100% of the total amount of the reservation will be charged. In case of no show 100% of the total amount of the reservation will be charged. The apartement is not available for the indicated dates. Select dates to see the total price. Please select a number of nights greater than 4. You have already applied for this apartment. All payments are made through a payment platform that is 100% secure. The Total Price includes taxes, management fee and the cleaning fee. In less than 24 hours you will receive an email as the application has been accepted as well as the instructions to formalize the reservation. We found an error, please try it again in a few seconds. Please, before the inquiry you must select the dates and the number of guests. Sorry, this property is not available for the indicated dates.